CRAFTSMAN 2000 Series 41-in W x 41.1-in H 7-Drawer Steel Rolling Tool Cabinet (Black) CMST24179BK. Some minor dents (see photos). The Deep power tool drawer in cabinet includes outlets, cord access and a convenient place to hang, organize and charge power tools. Power tool holders and accessory shelf included for easy organization. Each drawer can support 100-lbs and features soft close drawer slides that gently pull themselves shut without slamming. There's also a built in worksurface on the cabinet full width drawer that folds out of the way for maximum versatility. Large 5-in casters support 1,500-lbs. Husky 72 in. H x 46 in. W x 24 in. D Welded Steel Floor Cabinet in Black/Gray, KF3F462472-H9. - Dented Bottom. Dewalt 38 in. Mobile Tough Chest Tool Box, DWST38000 - Crack in Box near handle. Dewalt 38 in. Mobile Tough Chest Tool Box, DWST38000. Crack in box near handle and small dent on side bar, otherwise In nice condition. The DEWALT DWST38000 63 Gal. Tough Chest is ideal for getting your larger tools and equipment to the jobsite. This chest is designed with 7 in. rubber wheels so one person can easily transport heavy loads. Extra-wide soft grip telescopic handle. 154 lbs. load capacity. Gladiator 72 in. H x 48 in. W x 18 in. D Steel Freestanding Garage Cabinet in Silver Tread, GAJG48KDYG. Ready to assemble and in nice condition. Deep shelves, including 1 bottom shelf, 1 stationary shelf and 2 adjustable shelves. Leveler legs. Weight capacity of 50 lbs. per shelf (when evenly distributed). Recessed handles. Gladiator 28 in. H x 28 in. W x 12 in. D Steel Garage Wall Cabinet in Silver Tread, GAWG28FDYG. Ready to assemble and in nice condition. 2 adjustable shelves each holding 40 lbs. Magnetic door latch. Built to last with steel cabinet panels, heavy-duty Allen head bolt screws and back plates for years of lasting durability. Husky 6 ft. 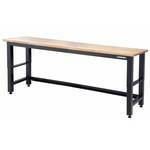 Solid Wood Top Workbench, G7200S-US - In Manufacturers Packaging - NEW. Supports up to 3000 lbs. and features an adjustable-height solid wood work platform to facilitate a multitude of operations. Adjustable in 1 in. increments from 28.3 in. to 42.1 in. Measures 72 in. W x 24 in. D x 42 in. H (adjustable height). Work from a seated or upright position. They are heavy and you are bidding on one unit from this pallet. Husky 8 ft. 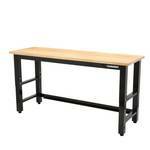 Solid Wood Top Workbench, G9600-US1 - In Manufacturers Packaging - NEW. Workbench supports up to 3000 lbs. and features an adjustable-height, solid wood work platform to facilitate a multitude of operations. Adjustable in 1 in. increments from 28.3 in. to 42.1 in. H. Adjustable feet. Allows you to work from a seated or upright position. Measures 96" L X 24" W X 42" H (Adjustable Height). They are heavy and you are bidding on one unit from this pallet. Wholesale Pallet of Returns - Husky & Dewalt Air Compressors. These are retail returns from big box home improvement stores. These items could be missing parts, need minor/major repair, or just scratched and dented. These units are sold as-is and are intended for those who are familiar with small engine/power tool repair. Please inspect before bidding. PALLET CONSISTS OF: 1 Husky 20 Gallon 135 psi Compressor, 1 Husky 30 Gallon 175 psi Compressor, 1 Husky 33 Gallon 165 psi, 1 Husky 20 Gallon 150 psi Compressor and 1 Dewalt 15 Gallon 200 psi Compressor. All Husky Motors work, the Dewalt Power cord has been cut, could not test. Wholesale Pallet of Returns - Husky Air Compressors. These are retail returns from big box home improvement stores. These items could be missing parts, need minor/major repair, or just scratched and dented. These units are sold as-is and are intended for those who are familiar with small engine/power tool repair. Please inspect before bidding. PALLET CONSISTS OF: 1 Husky 10 Gallon 135 psi Compressor, 1 Husky 30 Gallon 175 psi Compressor, 1 Husky 30 Gallon 175 psi and 1 Husky 20 Gallon 150 psi Compressor. All Motors work, The small 10 Gallon motor barely works. Honda Honda GX200 3,400 PSI 2.5 GPM Gas Pressure Washer, DXPW3425 - Missing Pump, Otherwise in nice condition. Needs Assembly. Pro-style spray wand with 5 quick connect nozzle tips - 0°, 15°,25°,40°and soap applicator nozzle. Convenient on-board accessory storage for spray gun/wand, high pressure hose and nozzles. Downstream detergent injection system for use of cleaners. 1/4 in. x 25 ft. high pressure steel-braided hose.